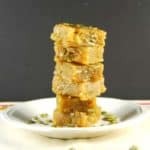 Chana Dal Burfi is a sweet Indian fudge-like sweet made with lentils and nuts and flavored with a hint of cardamom. This version is vegan and dairy-free. 1 cup chana dal or Bengal gram dal soaked in enough water to cover by two inches for four hours. In a saucepan, combine the soaked, drained chana dal with 2 cups of almond milk and bring to a boil. Lower the heat, cover the saucepan, and cook for 30 minutes or until the lentils are really tender. Turn off the heat, let the mixture cool a little, and then blend into a coarse paste in the food processor. Heat the oil in a large wok or skillet. Add the blended chana dal paste and sugar and cook, stirring frequently, until the paste is quite dry. It will be very sticky looking, but there won't be any visible moisture. Add the grated coconut or coconut milk, remaining 1 cup of almond milk, cashew cream, pumpkin seeds, and cardamom. Cook over medium heat, stirring frequently, until the mixture is again dry and starts to turn slightly opaque where it touches the pan directly. Grease a square 8-inch cake pan or dish with deep sides. Turn out the hot chana-dal mixture into the pan and, using a spatula or knife, spread the mixture into an even, smooth layer. Sprinkle and press on some more pumpkin seeds on top, if you wish (optional). Let it cool thoroughly, or place it in the refrigerator overnight. With a sharp knife, cut it into even squares.